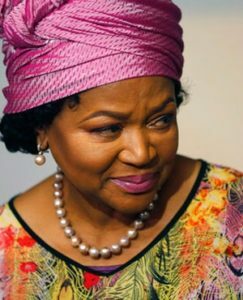 Born on the 24th of September 1949 in South Africa, Baleka Mbete is a South African politician who is the Speaker of the National Assembly of South Africa serving since May 2014. Previously she was Speaker of the National Assembly from 2004 to 2008 and Deputy President of South Africa from 2008 to 2009 under Kgalema Motlanthe. She was elected National Chairperson of the African National Congress in 2007 and re-elected in 2012 and served until 18 December 2017. On the 18th of December 2017 during the ANC’s 54th conference her position as National Chairperson was succeeded by Gwede Mantashe. In 1976 she went to exile and she taught in Mbabane in Swaziland, and went on to work for the African National Congress (ANC) in several other African cities, including Dar es Salaam in Tanzania, Nairobi in Kenya, Gaborone in Botswana, Harare in Zimbabwe, and Lusaka in Zambia. She returned to South Africa from exile in June 1990. She was born on the 24th of September 1949 in South Africa. As of 2018, she is 69 years old. She has two children Duma Kgositsile – Son and Nkuli Kgositsile – Daughter. Certificate of Teaching, Lovedale Teachers College. Post Graduate Certificate Framework for Governance at the University of Cape Town. Post Graduate Certificate International Humanitarian & Human Rights Law at the University of Cape Town. After going into exile in 1976, Mbete taught in Mbabane in Swaziland. She taught at Isibonelo high school for one year (1974-1975)., and also taught at Mater Dolorosa High School in 1978 to 1981. Mbabane political career started immediately she returned from exile, she was elected the secretary-general of ANC Women’s League, serving in this position from 1991 to 1993. She went on to become the national chairperson of ANC at the 52nd National Elective Conference of the ANC held in Polokwane on 18 December 2007. May 2014- Present: Speaker of the Government of South Africa. 2007- Present: National Chairperson of African National Congress. 2008- 2009: Deputy President of South Africa. 2004-2008: Speaker of the National Assembly, Parliament of South Africa. 1996- 2004: Deputy Speaker of the National Assembly, Parliament of South Africa. 1994: National Spokesperson of the African National Congress. 1991-1993: Secretary General African National Congress Women’s League. Member of the Presidential Panel on the Truth and Reconciliation Commission. Member of the ANC National Executive Committee. According to the government gazette, Baleka Mbete earns R2‚716‚798 a year as of April 1 2015‚. That averages out to R226‚400 a month.